Today’s recipe was inspired by a good friend of my Kizzie Inc. This is a perfect recipe for the fall season! Wash apples and remove their stems. Stick the wooden skewers securely into the stem end of the apples. Chop salted almonds and add to a large bowl, set aside. In a double boiler, add 1 cup of water to bottom and boil, set the top pan aside, unwrap the caramels; place them in the top pan with the vanilla and 2 tablespoons of water. Place the top pan with the caramel mixture over the boiling water. Let them heat up, and stir them gently until they are completely heated and smooth. (please use a spatula to stir). Remove the double boiler with the caramels from the heat. Dip the apples one at a time into the melted caramel and coat them, by gently turning the apple in a circular motion to coat. Dip the coated apples into the chopped salted almonds, and place each apple in a cupcake paper and sit on a pan. Chill the apples in the fridge until the caramel is set, about 30-60 minutes. When ready to serve, remove from refrigerator and let the caramel apples sit on kitchen counter for about 15 minutes and enjoy!!! 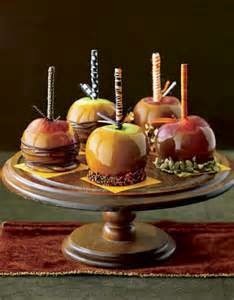 Kizzie Tip: Have fun anhkizzieinc.com/d try unique coatings for your caramel apples. Be fabulous!